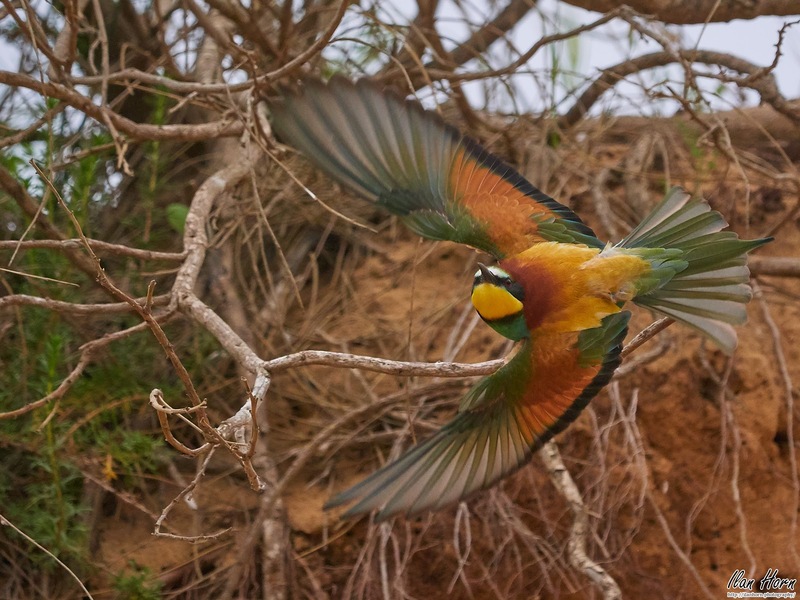 Another photo of the beautiful European Bee-Eater, this time showing the glorious wings fully spread. The color combinations are just hard to fathom. What do I like about this photo? The incredible wings, of course, with all this color. The eye contact is also awesome. I used a fast shutter speed (1/2500 of a second) to freeze the action, so the Bee-Eater is sharp. I used an open aperture (f/6.3 - the most open my lens supports at the focal length of 400mm that I used) to create a shallow depth of field, so the Bee-Eater is in focus but the background is blurred. What would I want to improve? The background is noisy. A more open aperture might have blurred it out more. A faster shutter speed would have ensured even the tips of the wings wouldn't blur.